The 50 simple recipes for cakes and bakes, both large and small, focus on nourishing ingredients such as nuts, vegetables, and dried fruit, plus flours such as rye or buckwheat. Many of the recipes are allergy- or intolerance-friendly, using wheat-free flours and unrefined sugars. Each recipe is clearly coded to show you which diet it will suit, along with an index to show you vegan, wheat-free, and dairy-free cakes at a glance. The emphasis is on including exciting new ingredients, rather than on cutting things out, showing how you can get the same amazing tastes and textures with healthy alternatives. With all the recipes checked by a qualified dietician, the cakes in the book show how you can embrace a more positive, balanced, and inclusive approach in your baking. All the ingredients can be sourced from supermarkets or larger health food shops. 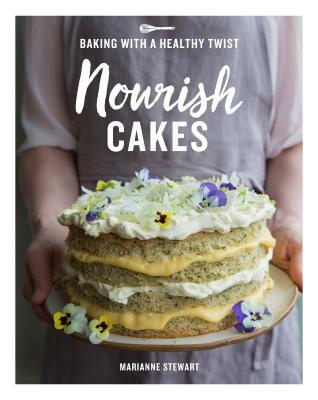 Nourish Cakes presents an alternative way of baking to a mainstream audience and makes it appealing, delicious, and exquisitely beautiful. Marianne Stewart is a trained pastry chef who has worked in a number of respected London kitchens, including Jamie Oliver's Fifteen and Peggy Porschen's Cakes, allowing her to develop an expert understanding of the chemistry behind baking and a flair for delicious flavor combinations. She teaches cookery classes and does private catering.